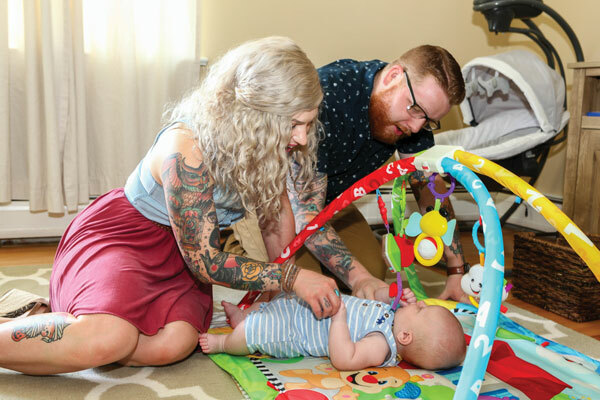 Entering the Fitzgeralds’ cozy Syracuse home and seeing the energetic, smiling baby who lives there, it’s difficult to imagine the chaos that he and his parents—Samantha and Stephen—went through just five months earlier. After a fairly uneventful pregnancy, Samantha’s blood pressure started climbing during her 37th week. When medication didn’t help, and the baby’s heart rate became irregular, the decision was made to induce labor. It took three days and the threat of an emergency cesarean section, but the fair-haired little guy, whom they named Everett, was seemingly healthy as could be. And, despite his early birthday, he weighed a healthy 6-pounds 7-ounces. Samantha and Stephen had met five years ago at J. Ryan’s in Syracuse and had quickly fallen in love—and married after a mere four months of dating (although they connected online a year before). They were eager to start a family, but after a year of trying, they were told conceiving was unlikely. She and Stephen had just started to accept the news, and consider their options through CNY Fertility Center in Syracuse, when Samantha learned that she was pregnant. “I could not even believe it,” she says, recalling the multiple pregnancy tests she took. When it was time to be discharged, the nurse who took his temperature noticed that it was a tiny bit low. Another check yielded the same result. But Everett displayed no other symptoms and his parents were assured that he would be fine—it was February in Syracuse, after all. But what should have been a happy homecoming for the young family became a dramatic introduction to first-time parenthood. “I could just feel that something was wrong,” Samantha recalls. Two days later, the Fitzgeralds rushed Everett to the pediatric emergency department at Upstate University Hospital because his temperature was low, he was vomiting, and he had become lethargic. The doctors were at a loss. Everett received intravenous fluids, a spinal tap and a brain scan. When the spinal tap came back cloudy, the doctors said there was a very good chance that Everett had contracted spinal meningitis. After another two hours of waiting, Everett’s scan came back with more promising results: no evidence of swelling or spinal fluid. Doctors ruled out the worse-case scenario, but Everett still needed to be monitored. Upstate Golisano Children’s Hospital did not have a bed for Everett, so the family returned to St. Joseph’s Hospital Health Center, where Everett had been born. By chance, he ran into Samantha’s midwife, Maggie O’Boyle; just the sort of friendly face he needed at that moment. She offered the couple use of her space at the hospital to regroup, and sleep if possible. Word of Everett’s predicament spread quickly on social media. Friends and family told their friends and family, and soon hundreds of strangers were praying for the tiniest Fitzgerald. One of Samantha’s former teachers even paid some of the Fitzgeralds’ parking costs while the family was at the hospital. The couple’s families rallied around them: Samantha’s family owns the beloved diner Mother’s Cupboard in Eastwood, where she works, and Stephen’s coworkers—he is a waiter at Pastabilities—made sure they had healthy meals. Still, Samantha rarely slept, insisting on nursing Everett every three hours to ensure that he had the nourishment he needed to get healthy. Hospital staff were concerned that Samantha was putting her own health at risk. “We balance each other out,” Samantha adds. After all the testing was completed, the doctors decided that Everett did not have meningitis, or any other life-threatening illness. Being even a little premature (what doctors call a late-preterm baby) made it just a bit harder for him to regulate his own body temperature. The news was a relief. But it also left the new parents with a heightened sense of caution that remains five months later. Stephen says that Everett still has days when his temperature dips. But doctors have told them that older babies can better handle slight changes in body temperature. So, they try not to worry, and focus on enjoying their little boy. They are fortunate in that their employers schedule them for alternating shifts—Stephen works nights, Samantha takes mornings—so that one of them is always home with Everett. The Fitzgeralds are doing their best to put Everett’s early health scares behind them and move forward. Everett is already scooching around when placed on his belly—and keeping his parents on their toes. His parents are busy doing all of the fun things that make the first year of parenthood such a life-altering journey. Samantha loves reading to Everett—sometimes up to four books a day—while Stephen, a singer and musician perhaps best known as a member of the local alt-rock band Black Throat Wind, sings to him and keeps a diverse playlist at the ready. “He could be screaming, and I’ll sing ‘Blackbird’ and it will calm him down,” Samantha says. The couple shares a love of tattoos. Many of them have very personal meanings and were designed to honor family members—and each other (she has “To have” on her ankle; he has “To hold” on his). So far neither has had a chance to get one since Everett’s birth. They say it’s just a matter of time. The Fitzgeralds advise other parents who may be facing the possibility of a premature induction to try not to let negative thoughts overwhelm them. “I know it’s easier said than done, but I would say, ‘Try not to worry. And try not to check every little thing on the internet,’” says Samantha.